Nimble was founded in 2009 by Jon Ferrera, who had a background in CRM as the co-founder of GoldMine Software and saw a need for a platform to efficiently unify multi-channel customer relationships. 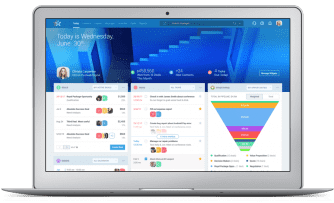 Nimble seeks to bring email, calendar, contact management and automation in sync with social media and other communication channels – in other words, combining social CRM with traditional CRM into a single platform. Nimble is headquartered in Santa Monica, California. Nimble offers a single pricing plan. Annual plans, which are available upon request, offer a 10% discount. Nimble bills per license; a license is one user. 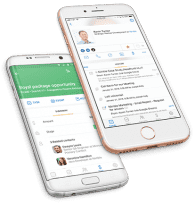 Business Plan, $25 per license/month; Contact Management, Sales & Marketing Automation, 100 Group Messages/Day*, 25k Contacts*, Deal Pipeline and Reporting, Email Tracking and Analytics, 2GB Storage/User*, Android and iPhone App. Certain features, like Group Messages or Contacts, can be expanded through account upgrades. The upgrades are as follows. 200 Group Message/Day Upgrade. $10 per Seat/month. 300 Group Message/Day Upgrade. $20 per Seat/month. Additional Contacts. $10 per additional 10,000 above the initial 25k. Additional Storage. $10 per additional 10GB. Note that Nimble cannot enable Group Message sends per hour or day that exceed email hosts’ daily limitations. Details are available here. Annual plans offer a 10% discount and are available upon request. Nimble accepts all major credit cards – Visa, MasterCard, American Express and Discover. PayPal and wire transfer are accepted for annual plans only. To request an annual plan, an account upgrade or special payment options, contact billing@nimble.com. Additional promotion: If your company doesn’t currently use Google Apps for Work, you can receive a 20% discount off your first year if you also sign up for Nimble. Reach out to googlepromo@nimble.com for your special promo code. Nimble provides an online knowledge base with FAQs, Walkthroughs, How-To articles and video tutorials organized by topic available here. Nimble provides support via public community discussion and social media. Their customer support Twitter handle is @NimbleCare. They offer open Q&A webinars with customer support staff with signups available here. Nimble support is available from 9 am to 5 pm, Pacific Standard Time (PST), Monday to Friday. Let me start off by saying that Social CRM is hard to get right. 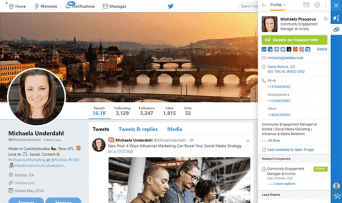 Usually when a CRM integrates social media, updates will come haphazardly or you’ll only receive notifications of a certain kind of engagement. Also, CRMs to date have been historically limited in which kinds of social media integration they provide. This is not the case with Nimble CRM. Nimble is built around social media and it provides the kind of automatic contact and company profile updates for which other CRMs would require configuration. When you create an account with Nimble, you’ll be prompted to connect your email, calendar and myriad social networks. After the email and calendar connection, you’re prompted to connect Twitter, Facebook, Gmail, Google+, Foursquare or Google Calendar. As you can tell, there’s close integration with Google. Afterwards, you can choose to import your contacts from Twitter, Gmail or via LinkedIn CSV. (You can forgo these steps and do it all later.) Aside from these options, Nimble allows importation of contacts via normal CSV, Outlook CSV, Instagram, IMAP, Office 365 and vCard. After you import your contacts, you can hit the ground running. Your Today dashboard shows you a list of Today’s Top Contacts – Nimble’s suggestion for networking which you can filter according to keywords targeting job title, industry or location. If you assign Contacts to tasks or deals, Nimble will keep you aware of potential engagement opportunities; there’s a task to-do list, a feed of recent social media engagement on various platforms, and a list of ongoing and upcoming deals. The overhead navigation bar lets you switch between this dashboard, and Contacts, Signals, Messages, Group Messages, Activities, Deals and Reports. You can search your contacts, refresh the page, ask for help, view notifications or access your profile and settings. The Signals feed, which is in beta, is unique to Nimble. From here, you can connect your social networks to see social activity in one view or separated by network; you can post status updates, send direct messages, search networks by keywords, conversations and people (and save those searches), view and import contacts, drill down on a specific contact and view your own profile, activity and mentions. Clicking on a person or company’s Live Profile will automatically compile their available social media activity, their contact details, a summary of their location, websites and social influence, not to mention find them on other social networks. On this page you can add them to Nimble (if they aren’t already) or enter Lead details like Type, Status or Source. The page will show you pending deals or provide the option to add one. The Messages tab will compile your messages and allow you to view them all or separate them by channel. You can send direct messages to connected channels (email, social media) from within the CRM. Group messages can have templates applied (Nimble doesn’t provide templates so you’ll need to build your own) and add recipients by searching for related names or keywords, save a message as a template or send a test message to yourself. The Activities tab will show you your Nimble agenda, which includes tasks and events integrated from external apps like Google Calendar or public data (such as holidays). You can create activities in Nimble, but it seems they won’t automatically appear in your integrated calendar apps. This seems rational – multiple Nimble users with individual schedules likely wouldn’t want their colleagues’ appointments crowding out their personal work calendar. Nimble allows its users to receive notifications for certain activities, such as when people interact with tasks, recipients open a tracked email or to receive a daily summary that includes personal events such as birthdays or new jobs. These notifications can be sent in an email, a pop-up window, or as a browser or desktop alert. Nimble also offers email widgets, browser extensions and mobile apps with the ability to obtain social media information from email contacts or add new contacts to the CRM. Nimble also provides a drag-and-drop visual deals pipeline with customizable stages, and a reports filterable by the week, month, quarter or specified time period. Nimble will also show forecasted deals and a deals history. Overall, the built-in reporting features are fairly basic. Then again, advanced reporting was never Nimble’s selling point. As data within a CRM is only as good as what can be done with it, Nimble boasts official integrations with widely-used marketing, accounting and customer service applications. These include MailChimp, HubSpot, Marketo, Freshbooks, QuickBooks, Xero, Zendesk and Freshdesk, Other integrations include Zapier, Wufoo and PandaDoc. Overall, Nimble has around 60 official integrations (available from its Marketplace) and provides a developer API for custom integrations. As far as CRMs go, Nimble offers more natural integration with social media than any other CRM I’ve tested to date. Their users consistently voice satisfaction with the CRM; Nimble was named the Best CRM by G2 Crowd for four years in a row, and ranked #1 in Customer Satisfaction in the G2 Winter 2017 rankings. Nimble won’t be your only business tool – it might not even be your only CRM. However, when it comes to Social CRM, if you’re looking for the best, Nimble leads the pack. What Do You Think of Nimble?